The ASUS Lyra WiFi Mesh System Revealed! We were recently invited to the launch of the ASUS Lyra. Lyra is a brand-new WiFi mesh system that is designed to provide large homes and offices with corner-to-corner wireless coverage. Let’s take a look at what a WiFi mesh system like Lyra is all about, and how it helps to deliver such extensive WiFi coverage! The ASUS Lyra (Lowest Price) WiFi mesh system consists of three WiFi hubs that boasts tri-band 802.11ac capability, offering speeds of up to 2134 Mbps. Usually, one ASUS Lyra per floor is sufficient, so the basic kit allows you to provide “blanket coverage” for a four-storey home or office building. Here is a closer look at one of the ASUS Lyra (Lowest Price) hubs. Up to five of these Lyra WiFi hubs may be combined to provide corner-to-corner coverage for multiple floors in the building. The ASUS Lyra (Lowest Price) WiFi mesh system greatly extends the wireless coverage of your existing WiFi router, eliminating WiFi dead zones. The ASUS Lyra (Lowest Price) mesh system creates a single WiFi network with a single SSID, so coverage is seamless. Your devices connects automatically to the strongest signal, and intelligently switches between Lyra hubs, without the need to change SSID. 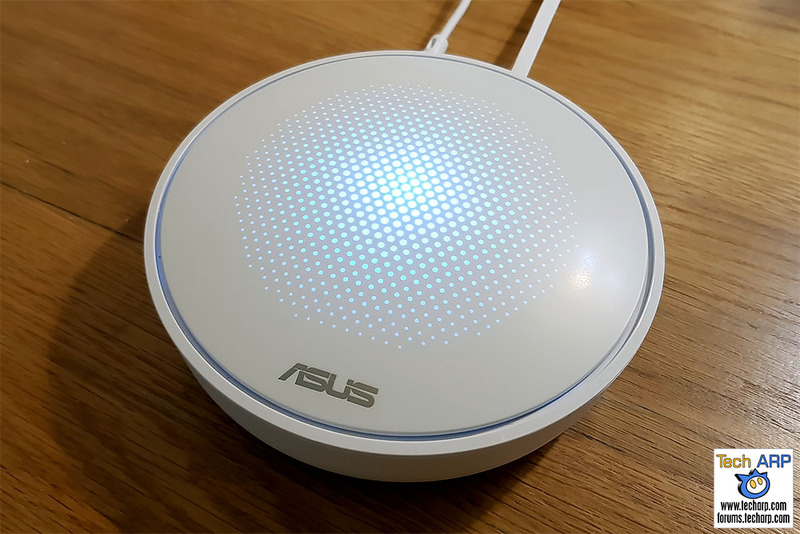 The ASUS Lyra (Lowest Price) mesh network uses three separate frequency bands. Each Lyra hub uses one band to communicate with the other hubs, leaving the other two bands free to connect to your devices. The Lyra’s stylish chassis conceals four smart antennas. Whenever a Lyra hub is added to the network, it assesses the signal strength and quality from each antenna, and selects the best two antennas to use. It also searches for, and connects to, another Lyra hub with the best connection. ASUS AiProtection, powered by Trend Micro, is built into every ASUS Lyra (Lowest Price) hub. This protects all connected devices, including smart home (IoT) devices, from intrusion, infections and malicious websites. Previous : The ROG Rapture GT-AC5300 Gaming Router Revealed! Next : The ASUS Blue Cave AC2600 WiFi Router Revealed!